Image Source: Igal Koshevoy. Source License: CC BY-NC 2.0. Adaptations: cropped. A transit readiness assessment and primer provides necessary steps to help communities prepare and plan for transit. Assessments may include suggested land uses, preservation of corridors, density, and typical per mile costs. According to the Locational Affordability Index developed by the U.S. Department of Housing and Urban Development (HUD), median income families in communities throughout the CONNECT region spend as much as 41% of their annual income on transportation costs. Over-reliance on automobiles for transportation has a detrimental effect not only on family budgets, but also on the environment. Increasing access to alternative forms of transportation, including transit, can reduce commuting costs for residents and improve air quality by reducing the number of vehicle miles traveled. A transit readiness assessment is an important first step that communities, regardless of size, can take to plan and prepare for transit. Transit-hopeful communities can use their comprehensive plan processes to identify, promote, and prioritize investment in transit-supportive development patterns in corridors and nodes, thereby creating transit-opportunity areas. Transit readiness assessments have the added benefit of helping communities plan for walkability and bike-ability as well, because development patterns that will support transit typically also support these other forms of active transportation. Assessments are often completed for communities along a key regional transit corridor or in conjunction with a regional plan. No two communities are alike. Therefore, there is no single strategy or approach to plan for successful transit in a community. A community transit readiness assessment should analyze existing conditions (e.g., current commuting/traveling patterns, land uses, income, current and projected demographics, etc. ), work with major stakeholders to develop local place-based solutions, and create individual work plans for communities. The assessment should take into account what types of development patterns best support transit and what investments could be made to prepare communities for transit. Recommendations should include what type of transit is appropriate for the location (e.g., dedicated bus lanes, BRT, commuter rail, light rail, etc. ), what land uses and densities are necessary to support new transit investments, typical per mile costs for construction, and a cost-benefit analysis with expected return on investment. Transit systems can be broken into two categories: rail and bus. Rail transit systems are able to attract and carry a greater number of passengers than bus transit systems, and are able to increase capacity by adding cars or increasing the frequency of service with limited additional capital investments, once the basic infrastructure is in place. There is often greater support for rail transit investments, as rail is considered a more reliable and attractive form of transportation with consistent headways (headway is a measurement of distance or time between vehicles in a transit system). Studies focusing on the impact of transit on development and land use reveal that rail transit tends to be a more successful method to catalyze development and raise property values. However, rail is typically built in medium-to-high density well-populated urban and suburban centers and initial capital costs can be quite high. Bus transit systems are more flexible, allowing for routes and services to change and expand as needed especially in dispersed or low-density communities. Regional/commuter rail is used to carry a large number of passengers over a long distance—20 to 30 miles or more; the proposed CATS Red Line from Charlotte to Mount Mourne is an example of a proposed commuter rail line. Unlike other dedicated right-of-way transit systems, regional/commuter rail construction costs can be relatively low as many systems use existing rail or surface corridors while fare revenues per passenger are relatively high. There are fewer stops for commuter rail than for light rail (e.g., one per community served) making this system beneficial for commuters traveling longer distances; this system is not appropriate for commuters traveling short distances in heavily urbanized areas where frequent stops may be needed. Heavy rail systems are typically used in highly urbanized areas along heavily trafficked corridors; the New Haven Line in metropolitan New York is an example. These systems are typically composed of a number of train cars (two or more) on a fully separated right-of-way. Capital costs tend to be quite high as underground tunnels or above ground corridors, overpasses, and stations are required to support a heavy rail system. Most systems have fairly frequent stops, however, express trains may be offered at peak times or for certain lines or routes. LRT, including elevated light rail and grade separated light rail, can be used for urban or suburban transportation corridors. The CATS LYNX Blue Line is an example of a light rail system. These systems operate with an overhead power supply enabling them to have the flexibility to run along existing street rights-of-way in mixed traffic, or in separate corridors where needed. LRT offers rapid transportation for short distances and is a cost-effective alternative to building an extensive subway system. While LRT requires a higher capital cost compared to bus transit systems, operating costs tend to be lower as LRT systems carry a greater number of passengers with longer headways. As is the case with other rail systems, capacity can be expanded by adding rail cars or increasing frequency of service as ridership increases, once initial infrastructure is in place. Similar to express bus systems, LRT systems may have park-and-ride lots to accommodate riders who travel from rural areas or outlying suburbs. BRT running way types vary in the degree of grade separation and lateral segregation from general-purpose traffic: separate (or segregated), freeway, or urban street. Depending on the level of separation from other traffic, BRT running ways often constitute the most significant capital costs, (costs increase with the level of separation). BRT can serve as a lower-cost substitute for light rail in urban areas if it runs on a dedicated running way with guaranteed right-of-way over auto and truck traffic, or as a means of serving lower density areas or outlying suburbs. In general, start-up costs may include new buses, shelters with facilities for centralized fare collection, and street enhancements (e.g., painted decals on dedicated BRT lanes and measures to ensure BRT’s right-of-way over other traffic). A primary advantage of BRT is that it can be adapted to meet the needs of a broad variety of contexts, while maintaining the ability to scale service to meet future ridership growth. Express buses connect suburban areas to large employment or population centers with limited stops. Express buses are often used by commuters with associated park-and-ride lots to accommodate riders who travel from rural areas or outlying suburbs. Express buses have fewer stops than local buses, can access HOV lanes where those lanes exist, and offer commuters a less-expensive, potentially faster commute. Their interior features typically are identical to local buses. Capital costs for express bus systems are relatively low as buses use existing roadway infrastructure. Costs may include new buses, bus shelters and/or benches, route signage, and the construction or rental of park-and-ride lots. Local buses, one of the most common forms of public transportation offered in several communities throughout the region and in many communities throughout the country, can serve large urban areas and suburban communities with regularly scheduled, frequent stops. Capital costs are relatively low as buses use existing roadway infrastructure. Costs may include new buses, bus shelters and/or benches, and route signage. Demand responsive transport (DRT) is a user-oriented form of public transportation that involves flexible route schedules and stops based on the needs of passengers. DRT is often utilized in rural areas or suburban areas without existing local bus service to serve seniors, disabled persons, and other special needs populations, and is available everywhere within the CONNECT region. DRT can be funded by a non-profit organization, through state or local subsidies, private companies, or by the local transit authority. Examples of DRT systems include medical shuttles and airport shuttles, vanpools and other programs that provide job access. Another example of DRT is the volunteer transportation system (VTS), focused on providing free, non-emergency on-demand transportation for older adults, veterans and persons with permanent or temporary disabilities. VTS is designed to fill the gap and help individuals who do not qualify for other transportation services. This type of service can reach places or serve at times when other systems are unavailable. VTS (offered on a limited basis in CONNECT region by Centralina Connection), relies primarily on volunteer drivers. Maintain contact with regional organizations such as MPOs, RPOs and COGs concerned with growth and mobility issues, so that any local or corridor discussions are in sync with regional or sub-regional planning efforts. Work with regional and local policy-makers and planners to review the CONNECT Regional Growth Concept consensus potential transit corridors, and to discuss their relevance for your community, county, and the region. Ideally, a group of communities along a potential transit corridor will undertake transit readiness assessments and discussions concurrently, so that the entire corridor is considered in planning. Convene a group of local officials, department heads, developers, transportation experts, transit agency officials, and other interested regional and local partners to draft a transit readiness assessment for the area. Identify a study area: a specific district or neighborhood, a municipality, multiple communities along a corridor, or a larger region. Review existing plans for the study area. Look at existing Metropolitan or Community Transportation Plans (MTPs or CTPs), comprehensive plans and neighborhood plans to see what recommendations were suggested for both future land uses and transportation improvements or expansions. Identify where recommendations within the local plans align with existing regional or state plans for transit improvements, and where there are differences. Collect all relevant information about the portions of the communities proposed to be served by the major transit corridor, by feeder systems, or by park-and-ride collector lots. This could include street network data, existing and projected demographics, real estate market analysis, walk score information, land uses and densities in and around the study area, and existing transportation and commuting patterns. Review CONNECT’s Transit Readiness Primer and detailed chart for an overview of the types of transit available, passenger capacity, typical per mile costs, service range, distance between stations/stops, necessary facilities, recommended densities, and supportive land uses for each. Host public meetings with relevant stakeholders and the public to discuss existing conditions and potential strategies to accommodate future transit investments. Talk with residents about the importance of density, design strategies, and diversity of land uses in planning for transit. Discuss what types of transit the community may be able to support based on existing conditions. If density levels are too low to support regularly-scheduled fixed-route bus transit or any form of BRT or rail transit (see The Neighborhood Transit Readiness Scorecard), discuss strategies to increase density. Another alternative is to focus on alternative methods of transportation (e.g., bike lanes, improvements to sidewalks and the pedestrian environment), which may provide local commuting alternatives and also help to stimulate increased interest in higher densities that will eventually support transit. Ensure that local plans are coordinated with those of neighboring municipalities along the identified potential transit corridor(s), and work with transit agencies and MPOs to develop phasing plans to ensure continuity of proposed transit in the region. Compile recommendations into one or more transit readiness assessment documents (depending on the number of communities and corridors involved) to be used for seeking out funding sources and working with partners to implement strategies. Work with partners following the completion of the assessment to determine what short-term goals can be met. For example, if diversity or density of land uses needs to be increased, work with local officials to amend existing zoning codes or seek funding for incremental improvements to the pedestrian environment (e.g., streetscaping, trails, etc) that will promote and attract a denser pattern of development and higher mix of uses. Provide and advocate for policy support as needed. This could include supporting legislation to fund transit projects, zoning or development plan changes as noted above, protection of transit corridors, etc. Continue to involve the public, with updates on plans and progress on policy initiatives. Most communities that have transit systems have successfully worked with non-profit public campaigns to garner public support for transit investments and to advocate for local funding to provide the local share of transit construction costs. Image Source: Downtown on the Go. 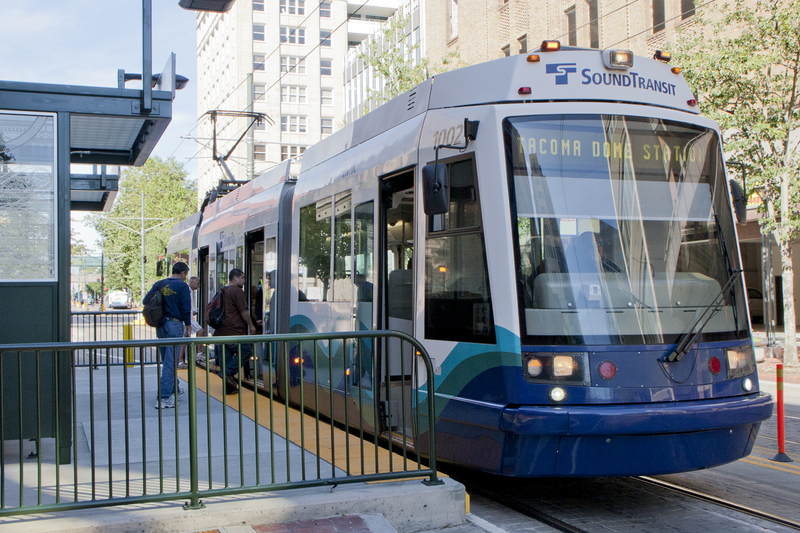 The Puget Sound Regional Council completed the Growing Transit Communities study, an assessment of 74 areas focused around existing and future locations of Sound Transit Link light rail stations and other key transit nodes. The study was completed utilizing regional goals set in the Vision 2040 report. Goals included attracting more residential and employment growth to high capacity transit communities, providing a diversity of affordable housing choices near transit, and increasing access to opportunity for existing and future residents of transit communities. Data from each of the 74 study areas was collected and analyzed to provide a number of corridor-specific implementation priorities, strategies, and next steps. The South Corridor, stretching south from downtown Seattle to downtown Tacoma (including two operating light rail lines and a number of proposed lines to be completed in the next 10 to 20 years), encompasses a number of racially and ethnically diverse communities and connects major employment centers in the region. Implementation priorities for the 24 planned and potential stations along this corridor are broken into three categories based on analysis of existing conditions: Protect and Grow, Enhance Community, and Stimulate Demand. Communities that fall under the Protect and Grow category are those existing transit communities with growing market potential. A key concern for these communities is preserving affordability while continuing to increase density. Enhancing Community includes communities that are low-density with an auto-oriented character, but have the potential to become denser transit and activity centers. Stimulate Demand communities have strong existing transit systems, but have low market demand. The goal for these communities is to capitalize on existing assets to expand job and housing opportunities. Recommendations include securing funding to extend light rail further down the corridor in Federal Way and Tacoma, taking short-term action to strengthen real estate markets for transit-oriented development in existing communities, ensuring continued stakeholder and community engagement throughout the process, and encouraging the development of housing for all types of families in the region. By working within the region’s existing framework, Vision 2040, the Growing Transit Communities study provides key strategies and actions individual communities and the greater region can take to realize their vision of a well-connected, healthy, and accessible region. All of the study areas along key transit corridors were analyzed for diversity of land uses, availability of housing, market potential, density, and demographics to determine what the character of potential transit would be in each area. The resultant ‘typologies’ (e.g., Protect and Grow, Enhance Community, and Stimulate Demand) take into account the analysis completed for each area and provide strategies to improve transit connectivity without adversely affecting existing communities. The Denver Regional Transportation District (RTD) is a regional public transportation authority that provides public transportation for 40 cities and towns in all or portions of 8 counties around the city of Denver. RTD was created in 1969 by the Colorado General Assembly. RTD operates as a public transportation system in the eight-county service area, which includes all of Boulder, Broomfield, Denver and Jefferson Counties, parts of Adams, Arapahoe and Douglas Counties, and a small portion of Weld County. The service area population of more than 2.8 million persons covers 2,348 square miles. RTD’s operations include fixed bus routes, express buses, light rail, shuttles, ADA paratransit services (called “access-a-Ride”), general public demand responsive services (“call-n-Ride”), “seniorRide,” vanpools, free shuttle services on the downtown mall, and other services. In 1999, RTD provided more than 99 million rides; in 2010, the average weekday boardings were at 331,121. The 2010 operating budget was $$391,800,000. RTD’s services focus on the general public, seniors, persons with disabilities (including developmental disabilities), welfare to work riders, and special programs for high school and college students. They also have a limited number of special shuttles and other programs. In addition, RTD looks for opportunities to fund and manage certain services rather than directly providing those services, when it is not practical or cost effective to do so. Therefore, another success factor is the strong partnership component of RTD’s efforts. For example, RTD provides funds to Boulder for its HOP service that connects the city with the University of Colorado campus and shopping areas; similarly, the North Front Range MPO in Fort Collins receives RTD funding to offer cost-effective long-distance trips. RTD also funds a variety of Transportation Management Organizations in the region. Just as important, RTD is involved in land use planning and coordination with its many stakeholders, as well as with private developers. Increasingly, many of RTD’s mobility management activities have a strong “data-driven” technology component. Automated passenger counters (APC) have provided a wealth of data for developing, monitoring, and communicating service details. Apps are available for travel planning including some mobile technologies for cell phone applications, bus schedule information at individual bus stops, and parking (for Park-n-Ride). Their call-n-Ride program has their own technology which includes automated scheduling through web bookings and estimated times of arrival notification. IT has become a core function that supports the operation and analysis of services provided by RTD. Finally, the agency maintains a sharp focus on customer satisfaction. Every few years, RTD conducts onboard Customer Surveys among passengers to learn more about riders’ satisfaction with the services provided. Riders are asked to evaluate RTD service in categories such as driver performance, park-n-Rides, web site, security, Telephone Information Center, convenience, customer information, fares, travel time, comfort, and traveling with bicycles. The surveys are used to measure customer perceptions of the quality of services, identify needed improvements, and help prioritize those improvements. The surveys also provide RTD with helpful information on trip characteristics and demographic profiles.